Enjoy your outdoor space with one of our contemporary awnings. Browse our collection of plain and striped designs today. Your installer will conduct a technical survey and double check every detail to make sure your Awning is just right. Transform your garden into the perfect venue for summer entertaining with our new collection of garden awnings. Choose from our range of innovative awning features, including sun and wind sensors, motorised controls and integrated heating and lighting. Love spending time in your garden? 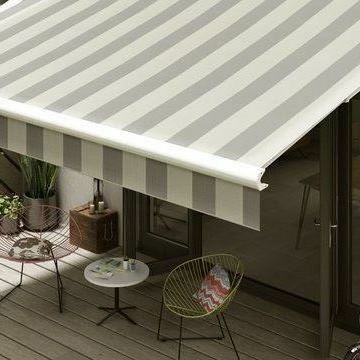 Browse our fabulous range of plain and striped awnings and create a perfect entertaining space. See our awnings range and arrange an in-home appointment with a specialist advisor to find out more about optional extras and finishing touches. How to make the most of the weather with a stylish and practical awning. If you’re considering a garden awning for your home, take a look at our short video following Tony and Stella’s story. They couldn’t be happier with their new awning and here they explain why it’s made such a big difference to how they use their outdoor space. 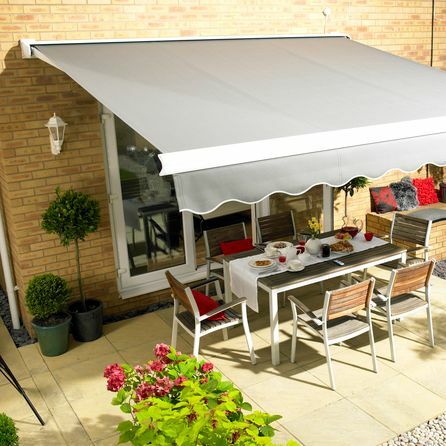 Stylish fabrics are just the start when it comes to choosing a garden awning. We’ve got lots of innovative optional extras to help you enjoy outdoor living in ease and comfort. Go for motorised controls and with the push of the button, your awning will automatically open and close, leaving you free to entertain family and friends. If you’re a night owl, choose integrated lighting and heating, then sit back and watch the sun set without noticing the evening chill. You can even include an intelligent weather sensor which automatically opens your awning when it’s sunny and closes it again when it gets too blustery, so you don’t have to lift a finger. Plus there’s our range of high performance fabrics, which are moisture resistant and specially treated to help prevent fading and weathering. So you can be confident your awning will enhance your garden space for years to come. And of course you’ll benefit from the expertise of our specialist advisors who’ll talk you through all the options, including making sure your awning is positioned perfectly to provide the right amount of shade throughout the day. Book an in-home appointment and browse our great range.